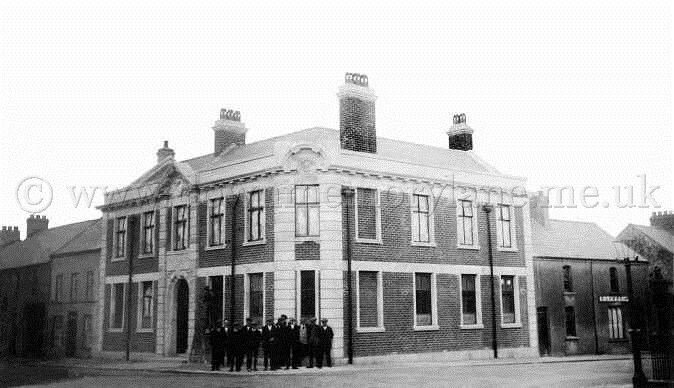 This is the Police Station on Main Street, Crumlin around 1912. The poster on the door next to the Police station reads " Royal Navy and Royal Marines " and where the nearest recuitment center is. Next shop is Mr. R. Wilson's who is a Tailor. Then we have a little girl standing outside her house with her hands on her waist posing. It appears that life moved at an altogether more sedate pace in Crumlin back in 1911. There were few cars on Main Street then, and horses and carts were not just wheeled out for festival days. The shop on your right certainly served the townsfolk well, offering cigarettes, tobacco, pipes, 'Pratts Spirits' and even a horse clipping service! Though it may not be clear here, the next shop up is actually a butcher's, as there is a leg of beef hanging up outside the window - and below on the ground are turnips. Behind the horse and cart standing sideways is the daily horse and coach with the number 160 on the front of it. The picture can be dated quite accurately because it is actually a postcard, which was sent to Fintona in County Tyrone on July 6, 1912. The charming message, written by 'Em' reads 'I expect you are having a fine day to yourselves. Weather lovely here. It's 5pm and no sign of that tel yet. Whatever are you doing? It continues: 'No news for a letter today. Everything just as usual. Will be expecting a long letter tomorrow. Give that gentleman on Sunday a chance and put a word in for me'. 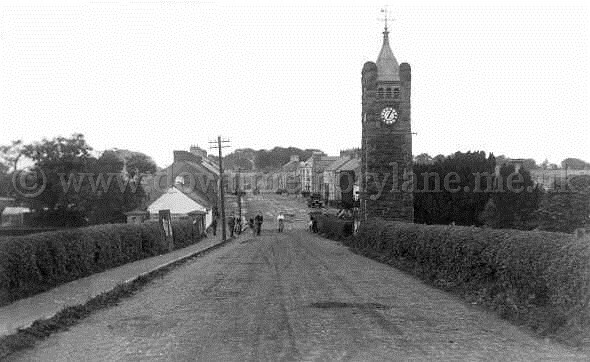 Taken around 1912 to your right you can see part of a thatched cottage. Next is a shop with the owner and his wife standing proudly outside. The shop owner has a pocket watch on. Further up the the street is a man sitting reading a newspaper perhaps the Antrim Guardian? In the distance are two cars parked and beyond that the Pakenham Memorial Monument. Halfway down the photograph to your left is a parked car and in front of it a man on a bicycle. Coming on down you see a thatched cottage and on the edge of the kerb is Water Pump with a long Handle. In the foreground sticking out is an awning belonging to another shop and as you can see no tarmac roads yet. 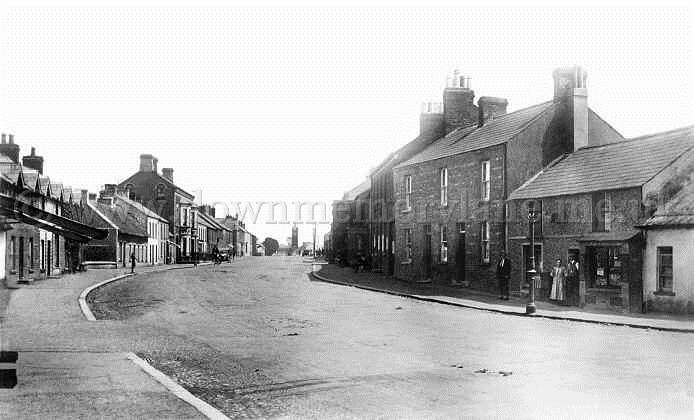 The photograph was taken in 1911 and the town by then has gas street lighting. The first shop to your left has a sign on the window saying " Dodds Moor-Ill and Scour Drenches have no equal ". The small sign says " Dougalls something Fly Dip ". The next shop is the Post Office with a young lady standing outside it. Next to her is a young girl and a middle-aged lady dressed in black with a small boy in front of her. Further up the street is a man standing outside his shop with a large apron on. Behind the man posing on his horse and cart on the far gable wall is an advert saying " Gillen ". The card is Postmarked Bandbridge 10am 23rd May 1912. To: Mrs Walker Post Office Crumlin. 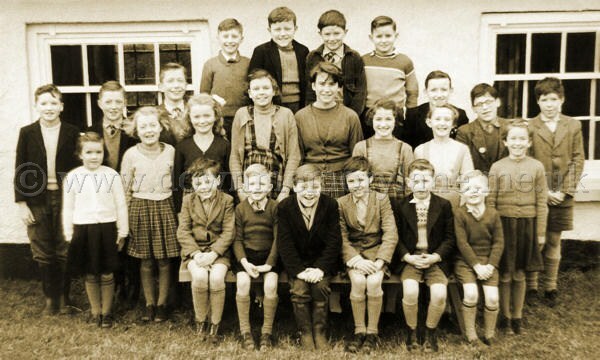 This is outside Mountcottage Primary School which was on the Dungonnell Road at Crumlin in 1960. These are the pupils of the class of 1959-1960 and at the back from the left we have Ken Williamson, Tommy McKinstry,John James McKinstry, Albert Campbell, Jim Wilson, Brian Hall, Ken Bickerstaff, Walter McNeilly, Ronnie Whiteside and Philip Grayson. Front row has Sylvia Bickerstaff, Carol McKinstry, Gladys McKinstry, Kathleen Bickerstaff, Maureen Robinson, Roberta McNeilly, Irene Campell &Viola Campbell. Seated are Walter Grayson, Sam Gilmore, Philip Wilson, David Grayson, Raymond Bickerstaff and Norman Gilmore. Absent that day was Mervyn Campbell, Robert Campbell, Wilfred Campbell, Rae Campbell and Norman Robinson. 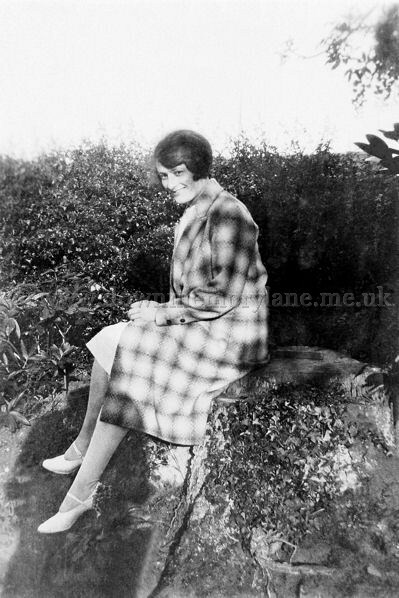 It's May 1928 and this is Miss Hurrell having her photograph taken. 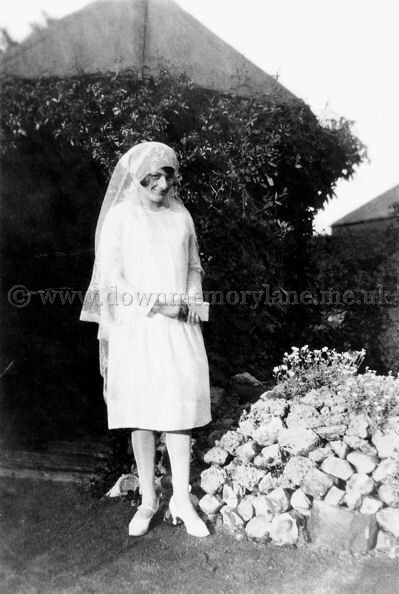 This lady is Miss Hurrell, is the outfit for her Confirmation, Wedding or is she becoming a Nun? let me know if you do. To the left of the photograph the name on the oblong sign looks like 'Plowery'. The next premises are selling Bycles and have signs for Shell, Mobil and B.P. The horse and cart further down are facing the camera and the state of the road tells you it hasn't a tarmac surface. Postmarked Crumlin 1.30pm 17th July 1924 (1d) To: Miss M. Walker, 181 Crumlin Co. Girl Guide Camp, Newcastle. 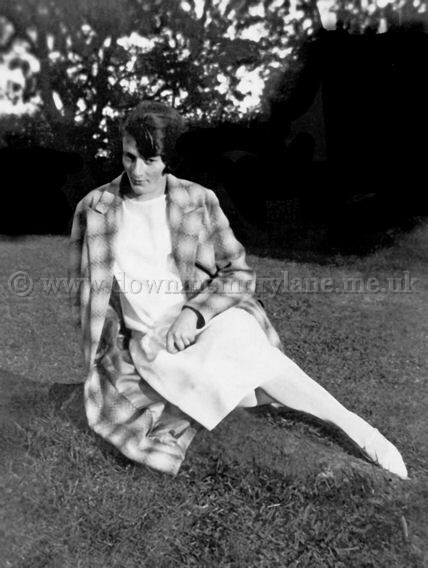 Co. Down. Many thanks for yrs glad all are having such a topping time, hope to see you soon again. 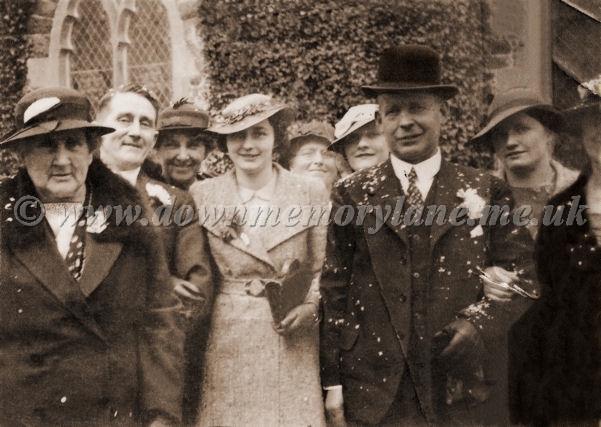 Obviously taken in the 1920's this group of wedding guests seem to be having a great time. The only person known is on the left Miss Elizabeth Dobbin. 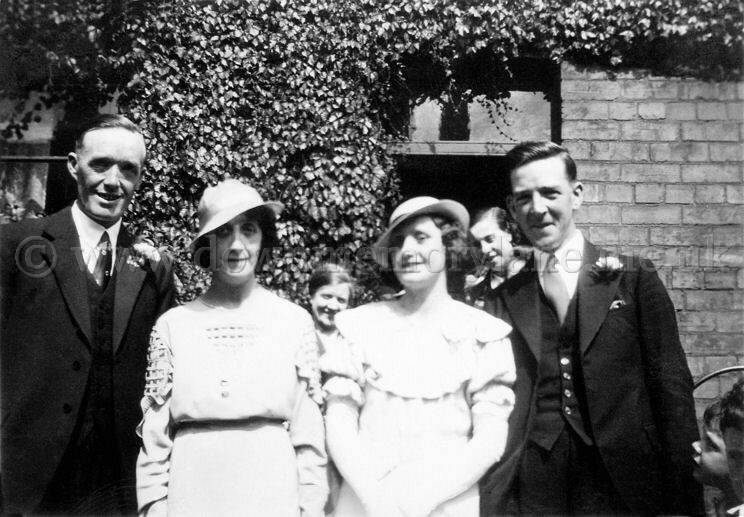 In this beautiful wedding photograph sadly only the best man on the right is known, he is William Murphy. If you do know the rest please let me know for it's a shame not to bring the photograph to life. 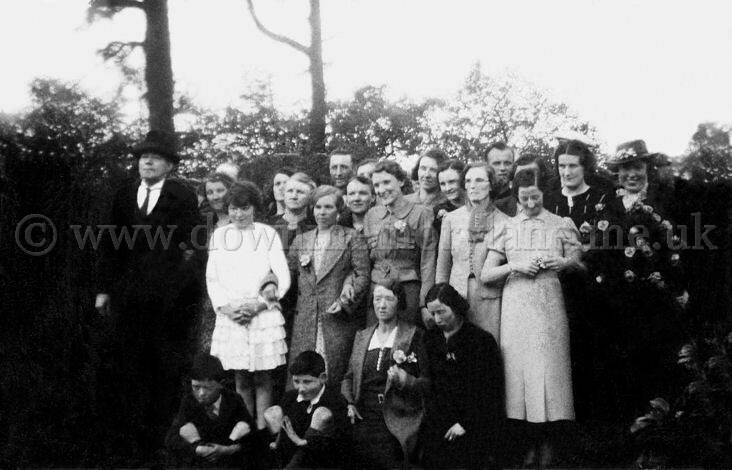 Sadly this lovely wedding group are all unknown, but if you know different please get in touch. 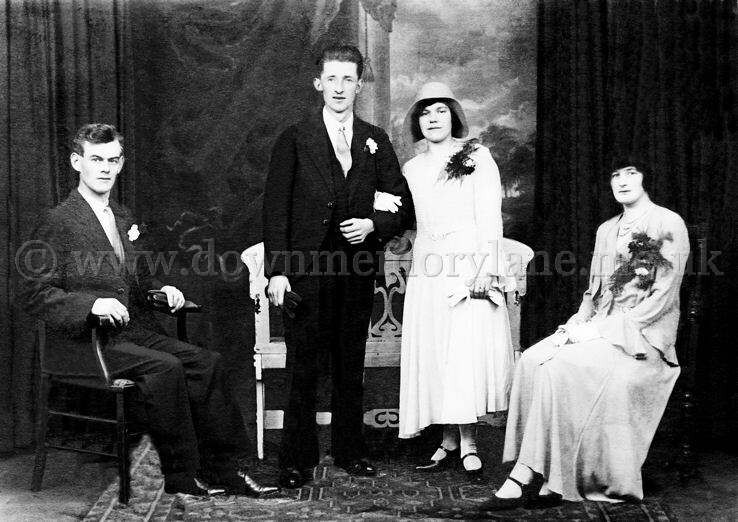 Here in the studio after their wedding in 1931 we have the groom John Murphy with his bride Elizabeth Murphy nee Dobbin. The best man is Harry Dobbin and the bridesmaid is sadly unknown. Taken at 12 Lombard Street Belfast by G Webb. 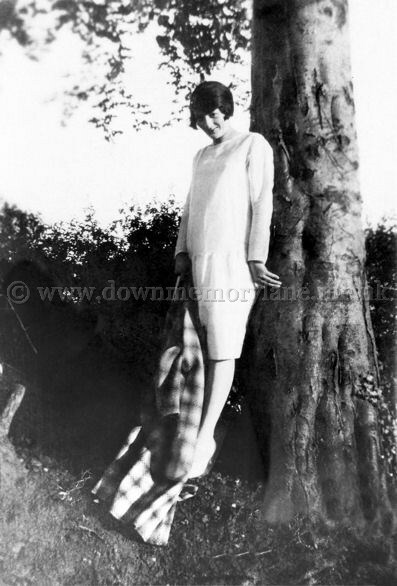 It's May 1928 and this Miss Hurrell taking a rest leaning against the tree. 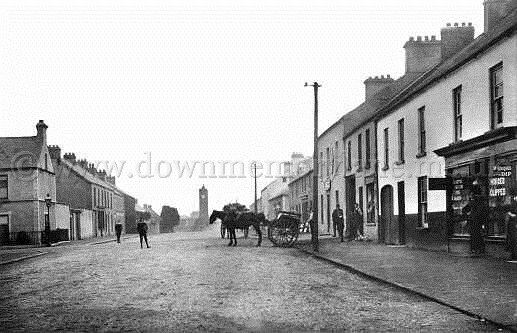 This is Crumlin Main Street to the right is a shop called R. Lowery, but what they did I do not know. The main building is the bank with a crowd of men standing in front of it. The year is unknown. 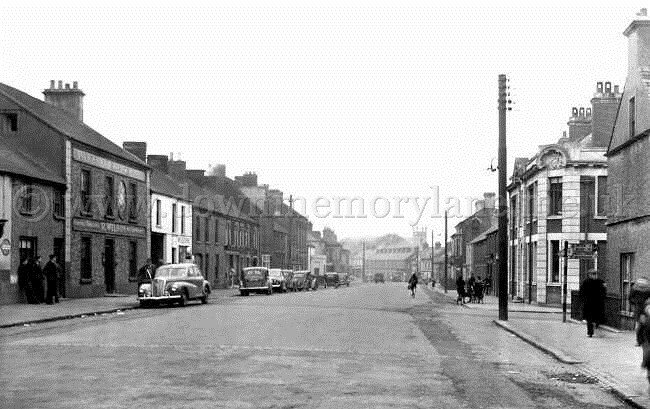 This is Main Street in Crumlin and to your left you can see the sign for the Pakenham Arms Hotel. Below that is another sign R. Wilson Funeral ? Next sign on the white building is Wilson, it's a garage. The car the man is getting into I am told is a Humber, the 7th car down is a Ford Popular. The year is unknown. 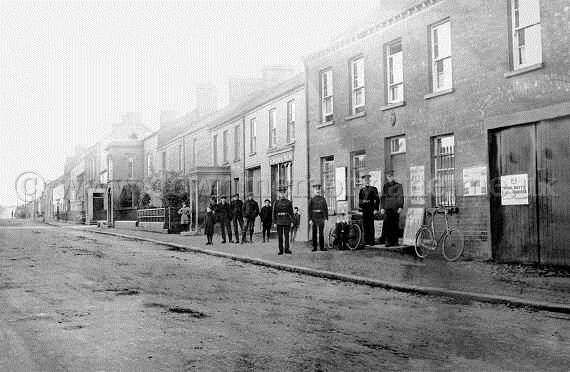 The photograph was taken at five past one in the afternoon looking towards Main Street but the date is unknown. The two people with bikes are men either side of the girl standing in the middle of the road. 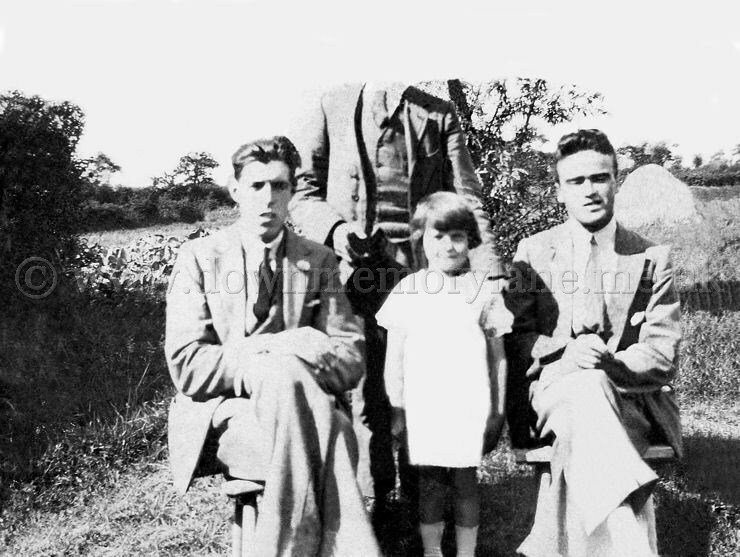 To the left are two men with four children and a very small girl beside them and next is a thatched cottage. Over to your right behind them is a Deliverly van and the driver standing next to it posing for the camera. 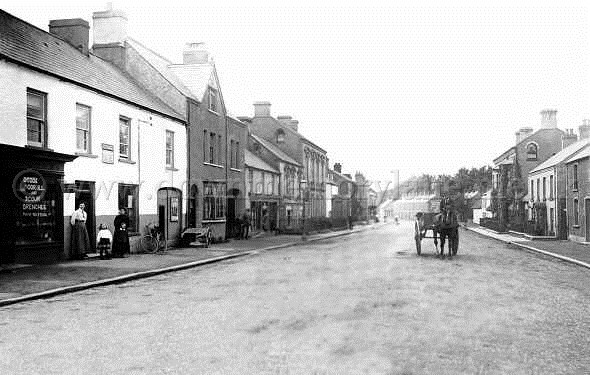 In the far background is a horse and cart heading out of the town and either side of it are two cars parked. 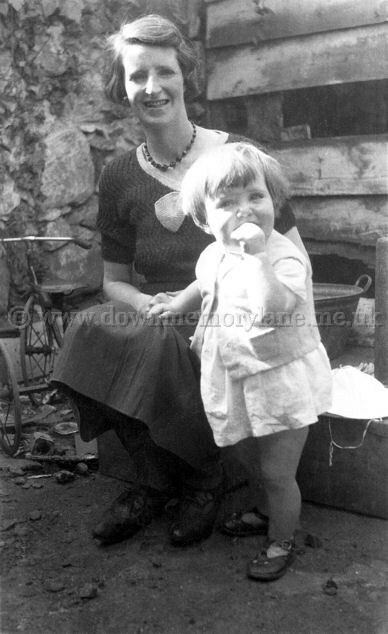 Sitting in her back yard we have Margaret McCormick and standing next to her the little girl is unknown. Perhaps the little girl is asking can she have go on the three wheeler behind them. Also behind Margaret is a tub which in my day when I was small was used to give you a bath! Here enjoying a night out in Crumlin we have Billy McCluney, John Murphy with their lovely wives Lizzie Murphy and Mrs McCluney. 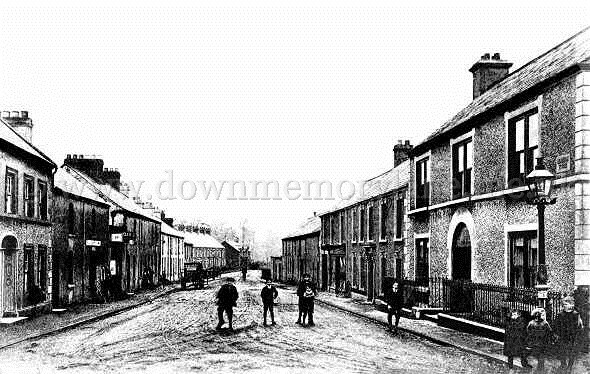 This is Main street, Crumlin in 1913. 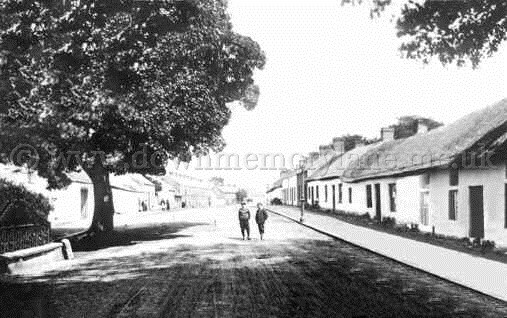 To your right you can see two lots of thatched cottages and not to much traffic about as the two boys in the middle of the road can prove. 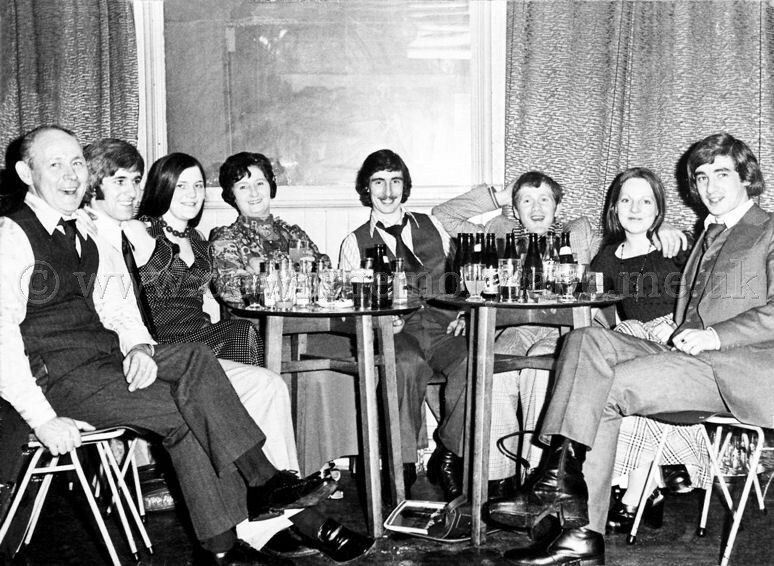 Arthur Butcher, Brian Murphy, Rosie Ward, Mrs Butcher, Gerald Butcher, Tommy Steele, Breidge and Willie Butcher. Out for a Sunday walk in the public gardens the Murphy family stopped to have their photograph taken. On the left is Sean, Elizabeth, William and John. 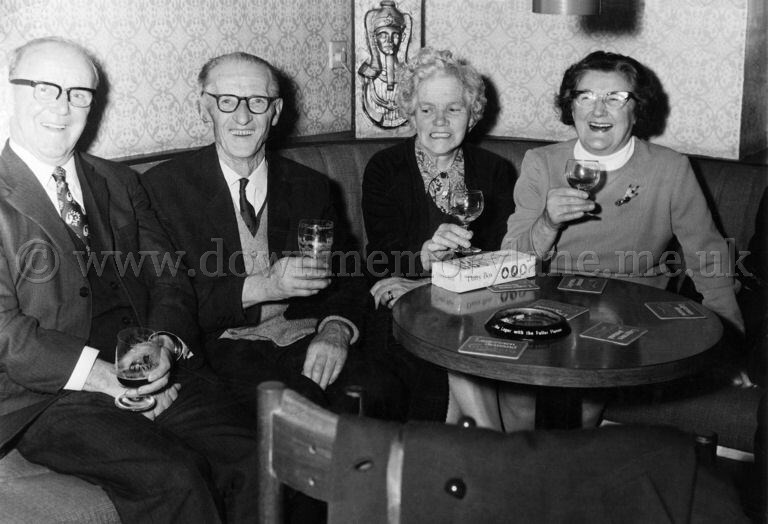 Only Elizabeth Dobbin is known in this photograph in which the people all seem to be celebrating an occasion. Could the girl in white be a May Queen? As you can most of the people here have flowers on the coats while the lady at the far right has her coat covered in flowers and also her hat. If you know the occasion please let me know. Out for a Sunday walk along the cobbled road these two young men stopped to have their photograph taken. 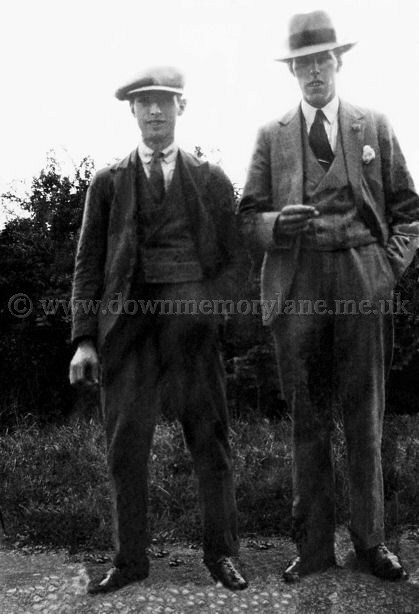 On the left is William Murphy and the other lad his his dapper suit with a rose in his lapel is at the moment unknown. 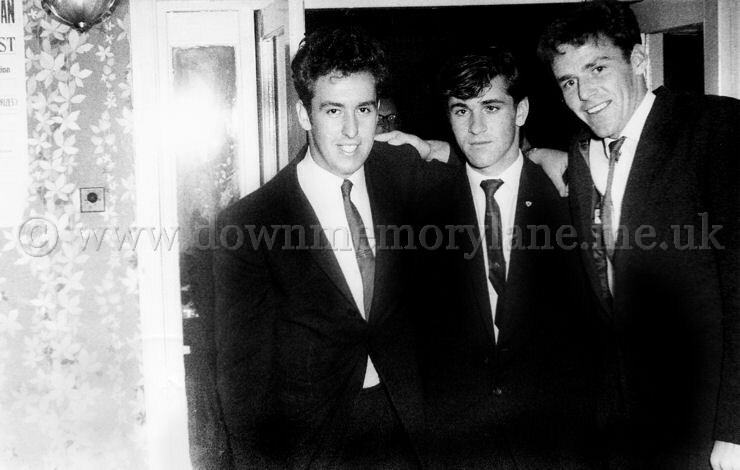 Out for the night these well dressed lads seem to having a good time and they are Hugh McCauley, Brian Murphy and Paddy McGee. 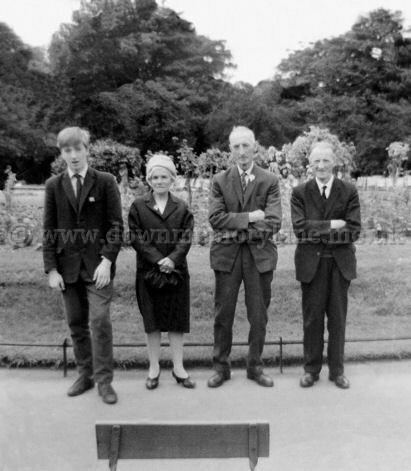 Here sitting in their back garden the group are all unknown. If you know any of them please let know and the man at the back. Behind them in the field is something that you will never see now a haystack! 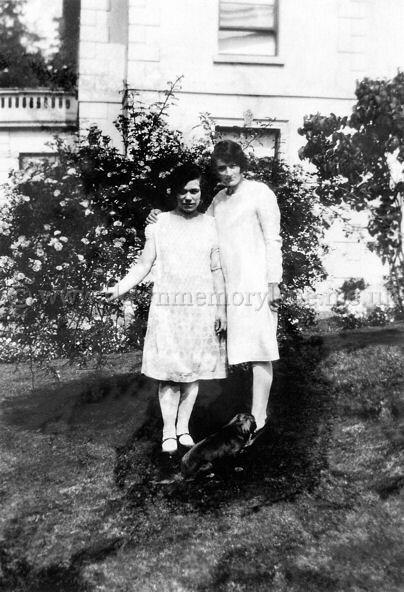 Standing posing next to the rose bush back in 1928 we have on the left Elizabeth Dobbin, her friend Miss Hurrell, the dog is Unknown. 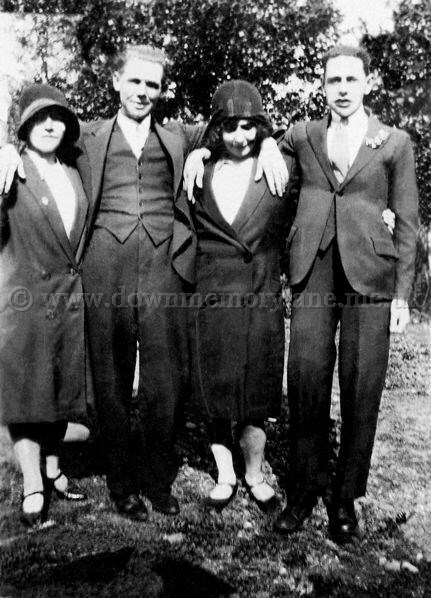 Here we are standing outside the church after the wedding of Fred McDowell and his bride Isabel McDowell nee Hanlon in 1928. 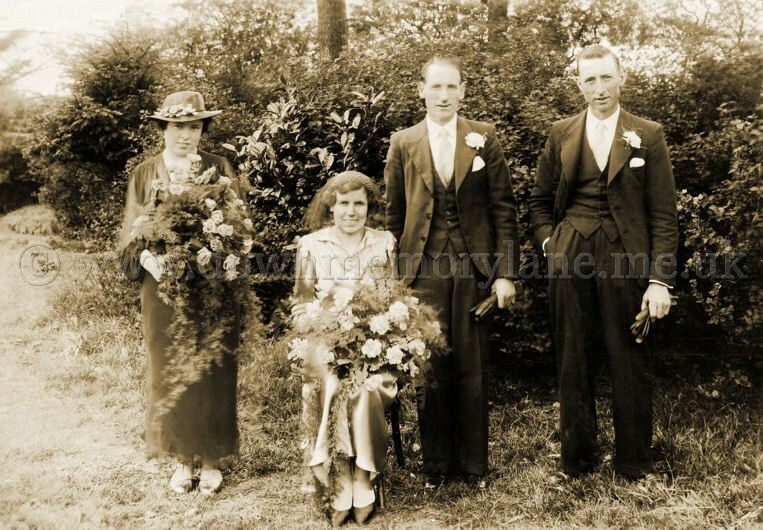 The people at the back are all Unknown so at the front on the left is Kate Hanlon the mother,then the father James Hanlon, next is Fred's sister her name is Unknown, then the Groom himself Fred McDowell but we don't know who is linked to his arm, I hope it's not the Bride! 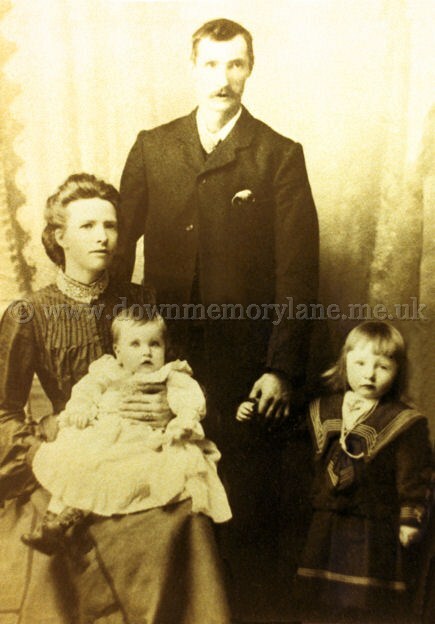 This lovely family photograph is of the Murphy family, dad is William Murphy while seated is mum Sarah and on her knee is their daughter Margaret. William is holding on to their son John to make sure he stays in the photograph.